We are pleased to join with Chris Tomlin, Matt Redman, Max Lucado, Luo Giglio (on a national level) and Eastwoods Presbyterian Church (locally) to see the nationwide simulcast of A Worship Night in America: an evening of united worship and prayer for our county, take place here in Vancouver WA. It will take place at the Kiggins theater on OCTOBER 25th. There will be “Live/local” prayer beginning at 5:30pm… followed by the simulcast from 6:00-8:15pm. 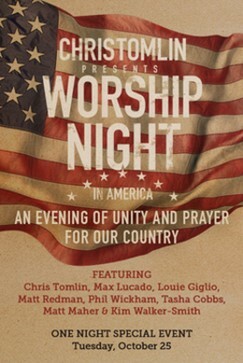 All the information you need is available at www.christomlin.com. Click on the “WA” tab, then the “Vancouver” tab. Just $12 for this ticketed event. Come and join us and spread the word!